Following the killings of civilians in Syria this week from some kind of gas attack, by perpetrators as yet unknown, the governments of the US, UK and France have swept aside any factual investigation, judged the Assad government guilty and are beating the drums ever louder for war. How has the Guardian responded to this? 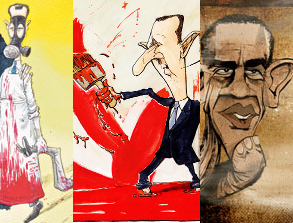 Aside from pro-war articles that parrot government statements , and column inches given over to pro-war commentators, there have been three cartoons in the last four days: two depicting Assad soaked in blood (one from Gary Barker, the other from Chris Riddell), and another from Ben Jennings ridiculing Obama for not going to war quickly enough. If a picture speaks a thousand words, these pictures are saying “go to war, go to war”, over and over again. Step-Back.org is calling on all journalists and commentators (cartoonists included) to step back from pro-war reporting and instead be responsible and accountable – please support us by signing our petition and sharing the site wide and far. absolutely! those cartoons were an absolute disgrace! the guardian has constantly drumbeaten for war.